On December 1, 1942, a flight of three P-47 aircraft left Westover Field in Chicopee, Massachusetts, for a formation training flight. While passing over the Westhampton area, the flight encountered thick cloud conditions and became separated. The cloud cover extended low to the ground, and one of the aircraft, (Ser. No. 41-5924), piloted by 2nd Lt. Charles C. Hay, crashed and exploded into the side of Tob Hill behind the Congregational Church. Lt. Hay was killed instantly. Lt. Hay, of Lauder, Michigan, was 21-years-old, assigned to the 340th Fighter Squadron. He’s buried in Grandlawn Cemetery in Detroit, Michigan. 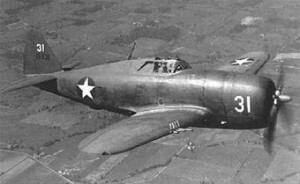 Another aircraft assigned to this flight, a P-47B, (Ser. No. 41-6011), crashed in the town of Cummington, Massachusetts, after the pilot was forced to bail out. The pilot, 2nd Lt. Jack Lastor, landed safely.